On-Scene Incident Commander - An 8-hour program for all personnel who will assume control of the incident scene beyond the first responder awareness level. 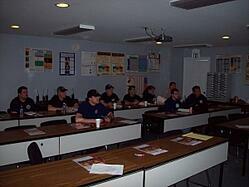 Personnel attending this training must have completed a 24-Hour First Responder Operations program. Meets the requirements of 29 CFR 1910.120 (q). Know how to implement the employer's incident command system. Know how to implement the employer's emergency response plan. Know and understand the hazards and risks experienced by employees working in chemical protective clothing. Be familiar with the state emergency response plan and the Federal Regional Response Team.Know and understand the importance of decontamination procedures.